Why are we talking about business card design tips? How does a business card can make a business more prominent? Business Cards might be the smallest marketing tool you have but when it comes to put an impact on your business, it has a great punch. It helps you spread the name of your company as well as putting the first impression. 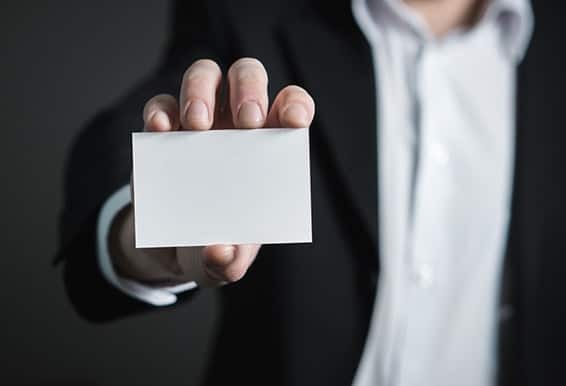 From small business organizations to independent retailers, a business card can do a lot for your brand and your connections. Thus it’s quite important to make your business card stand out from the crowd so that it can put a bigger impression on your potential customers. Here Print Hub presents 5 essential business card design tips to make your business card a stand out one. Business cards should be easy to read and understandable. That means go for simple & common text-fonts which are clearly visible and readable. In case your brand name or taglines requires a certain font, try to make it a bit spacious so that the style of the font doesn’t make the text complicated. Don’t leave one side of the business card blank as it gives impression more of a leaflet rather than a business card. Use this area to showcase your brand name or the logo or the website address printed on it. Let the main side contain all the important information. Thus, it will create a long lasting visual impression to the customers. Making your business card ‘easy to follow’ is another important criterion. Make it clear and easy to read and only include the most important information – your name, contact number, email address and position in a company will do the job for you. You shouldn’t compromise on the quality of paper when it comes to your business card. A thicker card with good paper quality will add an extra professional look giving a great impression. Besides, for its good quality, it is less likely to get damaged when being handed out to others. Choice of colours also plays a big role along with the text. Use the colours that fit the most with your business. Try to go with corporate colours like ‘black’ and ‘white’ or ‘grey’ for text and background images. With that being said, using to a singular colour or even just using a shade of ‘light blue’ can also work pretty well. If you would like to get more information on our print-works please get in touch with our expert team today.